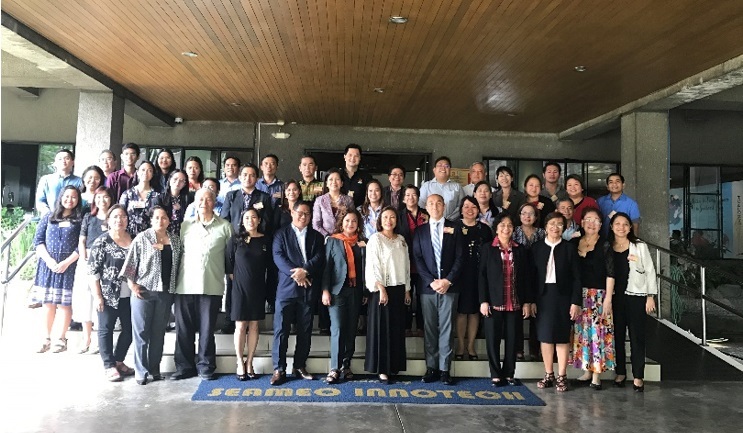 In order to engage key lifelong learning actors both within and outside the education sector in a multi-sectoral dialogue on the promotion of lifelong learning, the Department of Education, University of the Philippines Open University and SEAMEO Secretariat conducted a Policy Forum on Lifelong Learning on 8 June 2018 at SEAMEO INNOTECH, Philippines. This activity will contribute to the implementation of Sustainable Development Goal 4 “Ensure inclusive and equitable quality education and promote lifelong learning opportunities for all’ and SEAMEO seven priority areas, especially priority area 2 "addressing barriers to inclusion and access to basic learning opportunities of all learners [...] to provide for the previously inaccessible and vulnerable groups." This forum attended by 38 participants from various institutions in Philippines and Thailand. The policy forum aims to equip the participants with a sound understanding of current policies, plans and strategies for lifelong learning as well as their provision in the specific context of the country and of the region; serve as a platform to discuss how policies, plans and strategies for lifelong learning could be developed or strengthened in the country, drawing on examples of effective and relevant policies and practices at national and regional level; strengthen partnerships and networks among professionals and organizations involved in lifelong learning as well as to provide recommendations on how to develop/strengthen lifelong learning policies, plans and strategies.